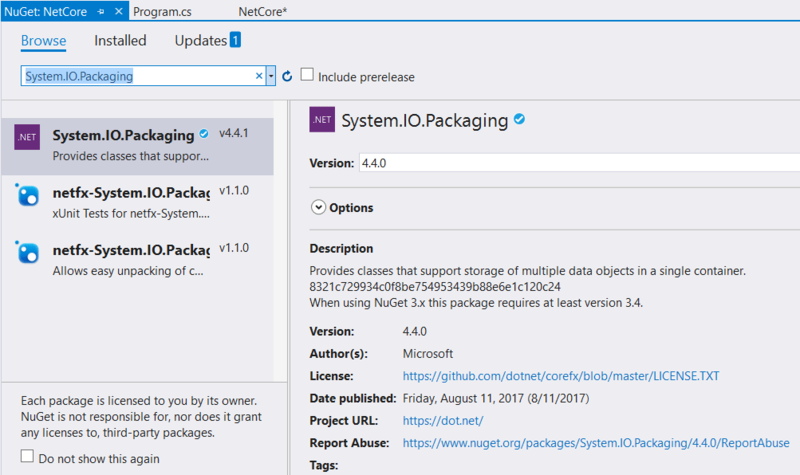 You can easily use «Document .Net» in .Net Core 2.0, 2.1 or higher. It's completely written in C# managed code and compiled under .Net Framework and .Net Core. Add the reference to SautinSoft.Document.dll. Add dependencies through Nuget (optional). First of all, download the Document .Net package (document_net.zip) from the SautinSoft website. Unzip document_net.zip and find the assembly file "SautinSoft.Document.dll". SautinSoft.Document.dll compiled for .Net Core is located inside (document_net.zip->Document .Net X.X\Bin\Net Core X.X) folder. SautinSoft.Document.dll compiled for .Net Framework is located inside (document_net.zip->Document .Net X.X\Bin\Net X.X) folder. If you have added the SautinSoft.Document.dll into your project in previous step 1 through Nuget, all dependencies are already installed automatically and therefore simply skip this step. /// Create file with Hello World. // Save a document to a file in DOCX format.
''' Create file with Hello World.
' Save a document to a file in DOCX format. Dim filePath As String = "Result.docx"